Only one of the five remaining candidates for governor, Democratic nominee Drew Edmondson (second from left), released detailed financial information, including his tax returns. Republican Mick Cornett (left) declined, and Republican Kevin Stitt (right) did not respond. Libertarians Rex Lawhorn and Chris Powell (third and fourth from left) provided some information. 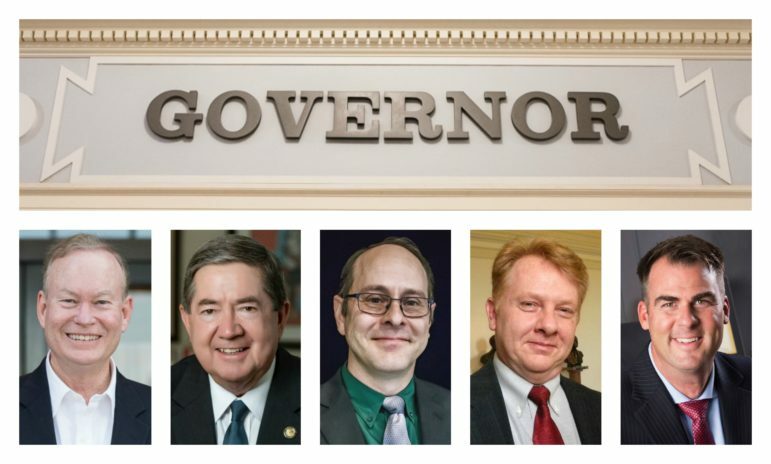 Three of them, including Democratic gubernatorial nominee Drew Edmondson, provided their federal income tax returns as part of their response to a request sent by Oklahoma Watch to all statewide candidates on July 6. Edmondson provided two years of federal and Oklahoma income tax returns and a detailed list of assets, obligations and investments. Declining to release any financial information were Republican gubernatorial candidates Mick Cornett and Kevin Stitt. Rex Lawhorn and Chris Powell, Libertarian candidates for governor, issued statements summarizing their finances but did not release many details or documents. Lawhorn said he intends to provide income tax returns but so far hasn’t made them available. All but five of the other 23 statewide candidates not running for governor have declined or failed to provide specific financial details as voters prepare to go to the polls for the Aug. 28 primary runoff, followed by the Nov. 6 general election. Two of the five – Charles Jules de Coune, an Independent running for state treasurer, and Ashley McCray, a Democrat running for corporation commissioner – released tax returns. John Yeutter, a Libertarian candidate for state auditor and inspector, provided a sheet with financial details. Corporation Commissioner Bob Anthony, running for re-election, and Randy McDaniel, running for state treasurer, provided summaries of their finances. Some candidates, while not detailing their finances, listed their affiliations with nongovernmental groups as requested. Oklahoma Watch’s request was made as part of its July 6 report about how Oklahoma did away with a rule in 2015 that required statewide candidates to disclose a barebones summary of their finances. As a result of the policy decision, Oklahoma’s required level of disclosure is significantly less than that for candidates for federal offices or statewide candidates in nearly three dozen states. Some Oklahoma candidates, such as Powell and McDaniel, said they had privacy concerns about releasing personal financial records or data. Advocates for government transparency say without financial details, voters cannot assess whether candidates have sources of income, investments, business dealings or liabilities that could pose conflicts of interest with their public-office responsibilities should they win. Edmondson, who secured the Democratic Party nomination in the June primary, provided his full 2016 and 2017 federal income tax returns that he and his wife, Linda, jointly filed. Edmondson, an attorney who served as the state’s attorney general from 1995 to 2011, also provided a two-page list of investment assets, asset activity, personal obligations, property ownership and positions held in nongovernmental organizations. He also listed 20 investment or mutual funds in which the couple has shares. The 2017 document shows the Edmondsons reported a total income of $313,135, including $101,213 from his business, Edmondson and Associates Consulting; $148,268 in taxable pension distributions; and $40,564 in taxable Social Security benefits. The filing showed the couple paid an effective tax rate of 28 percent. Total income in 2016 was $416,899. They own their Oklahoma City home and a one-sixth share in some rural Adair County property. Oklahoma Watch is publishing the 2017 federal tax return and 2017 state return; the returns were provided with redacted Social Security numbers and the home address. In a written statement, Edmondson said he chose to release personal financial information out of principle. Cornett and Stitt, who will face off in the primary runoff, declined to voluntarily release any details or summaries of their finances. “Mick has always taken accountability and transparency seriously, from chairing the audit committee at City Hall to submitting willingly to every disclosure required to him as a candidate, city councilor and mayor. He will continue the same level of commitment in the governor’s office,” campaign spokesman Will Gattenby said in a written statement. The Stitt campaign did not respond to repeated requests for data on his personal finances or provide his tax returns. Stitt also did not issue a statement about why he was declining to release information. The main general income sources for political candidates are usually well-known, though meaningful details are often not evident. For instance, disclosure forms typically don’t ask for the names of clients or customers of a candidate’s or elected official’s private business. In Oklahoma, state and local disclosure forms for officeholders have been revised to provide fewer financial details than in past years. Cornett, who served as Oklahoma City mayor from 2004 to 2018, earned $24,000 annually in pre-tax income from the city. He owns a video production company, Mick Cornett Inc. He is listed as the director, writer and producer of the documentary “Oklahoma City: The Boom, the Bust and the Bomb,” whose sponsors included, among others, media, energy, banking, insurance and retail companies. In annual disclosure forms filed with the city, including in 2017, Cornett listed his production company as his only outside employer and sole financial interest. In his 2015 disclosure, Cornett also listed his wife’s income from her job as an advertising salesperson at KTUL-TV in Tulsa. Cornett owns two condominiums in central Oklahoma City valued at a total of $965,000, according to Oklahoma County property records. He received an executive MBA in 2011 from New York University’s Stern School of Business. At the time, he said he was taking out student loans to pay for the 22-month, part-time program, which costs $194,876 for the upcoming semester. Stitt is the CEO of Gateway Mortgage Group LLC, which holds a loan-servicing portfolio valued at more than $16 billion and employs about 12,000 people in 41 states, according to his campaign website. He says he founded the company in 2000 with $1,000 in start-up cash. The company is not publicly traded, so no public information is available on Stitt’s income. He has never held public office and thus has not had to disclose investments beyond Gateway or any outstanding loans or liabilities. According to a 2016 court filing, Gateway is owned by trusts set up for Stitt and his wife, Sarah, and the couple’s six children. The most recent campaign filings show Stitt had loaned his campaign nearly $2.2 million as of June 11. Lawhorn said in his message he would provide his tax returns and that he earned about $48,000 a year managing a Tulsa auto paint store and has no investments. He said he recently purchased 20 acres near LeFlore for his retirement home. He has a separate mortgage with family members on his current house. Powell, who works for the Oklahoma City Police Department, said in his statement that he earns below the state’s median household income. His wife works for an Oklahoma City law firm. “Neither of us have investment income or assets beyond that of savings accounts and retirement accounts, none of which are as large as they really should be,” Powell said. Most of the 28 candidates for statewide offices declined to release details about their personal finances as requested by Oklahoma Watch. Many did not respond, and some refused. Mick Cornett Governor Republican Declined, issuing a statement. Kevin Stitt Governor Republican Did not respond. Drew Edmondson Governor Democrat Provided detailed finances, including tax returns. Rex Lawhorn Governor Libertarian Provided summary of finances. Chris Powell Governor Libertarian Provided summary of finances. Dana Murphy Lieutenant Governor Republican Did not respond. Matt Pinnell Lieutenant Governor Republican Did not respond. Anatasia Pittman Lieutenant Governor Democrat Did not respond. Gentner Drummond Attorney General Republican Did not respond. Mike Hunter Attorney General Republican Declined, saying he filed state disclosure form. Mark Myles Attorney General Democrat Agreed but has not yet released finances. Joy Hofmeister Superintendent of Public Instruction Republican Did not respond. Linda Murphy Superintendent of Public Instruction Republican Declined, saying she would only release finances if Joy Hofmeister does. John Cox Superintendent of Public Instruction Democrat Did not respond. Leslie Osborn Labor Commissioner Republican Did not respond. Fred Dorrell Labor Commissioner Democrat Did not respond. Bob Anthony Corporation Commissioner Republican Provided summary of finances. Brian Bingman Corporation Commissioner Republican Did not respond. Ashley Nicole McCray Corporation Commissioner Democrat Provided detailed finances, including tax returns. Blake Cummings Corporation Commissioner Democrat Declined. Cindy Byrd Auditor and Inspector Republican Did not respond. Charlie Prater Auditor and Inspector Republican Did not respond. John Yeutter Auditor and Inspector Libertarian Provided a list of financial details. Randy McDaniel State Treasurer Republican Provided brief summary of finances. Charles Jules De Coune State Treasurer Independent Provided detailed finances, including tax returns. Glen Mulready Insurance Commissioner Republican Did not respond. Kimberly Fobbs Insurance Commissioner Democrat Did not respond. In other statewide races, only five of the 23 candidates responded with at least some specific financial information. Most of the 23 did not respond to multiple attempts to contact their campaigns by phone and email, or they declined. The candidates are seeking election for lieutenant governor, attorney general, superintendent of public instruction, state treasurer, state auditor and inspector, corporation commissioner, labor commissioner or insurance commissioner. Seven of the candidates are current or recent elected officeholders and have filed financial disclosure forms with the state, although the revised state forms filed with the Oklahoma Ethics Commission in the past two years generally offer few details. Yeutter did not provide a return, rather a sheet with a list of income sources, investments and debt. He said one of his core values is government transparency. Anthony, while declining to release specific figures, described his finances in broad strokes in a letter. Anthony, who has served on the commission since 1989 and faces former Senate Pro Tempore Brian Bingman in the Republican runoff, said he had no mortgages or debt, other than credit card balances that he pays each month, and retirement savings in mass-market mutual and money-market funds.